– unless otherwise specifically authorized VFR flights shall not be permitted to land/take-off at Khok kathiam aerodrome when weather conditions as reported by ground observer are less than. – Except for the helicopters may be permitted to operated when the flight visibility are less than 1.5 km if maneuvered at a speed that will give adequate opportunity to observe other traffic or any obstacles in time to avoid collision. VFR flights shall be operated in the night time when otherwise specifically authorized only. 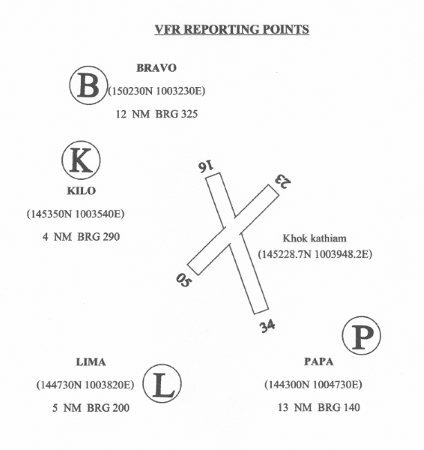 VFR flight within the Khok kathiam aerodrome traffic zone and local flights in VTD31 shall be conducted so that the aircraft maintain flight visibility and distance from cloud equal to of greater than. 2.1.4 No authorization for special VFR flights. 2.2.1 after take-off, aircraft shall continue climbing straight ahead until passing the departure end of runway unless safety or when specifically authorized by the control tower. Helicopter shall start turn when passing 200 ft.
2.2.2 Take-off from Rwy 16 shall right turn for leaved traffic. 2.2.3 Take-off from Rwy 34, Rwy 05 shall left turn for leaved traffic. 2.2.4 Take-off from Rwy 23 shall left or right turn as pilot requested. 2.2.5.1 Aircraft shall be reported of their the following information to the control tower prior to taxi for departure. 2.2.5.2 Aircraft shall be reported to the control tower when passing 12 NM or 5500 ft. which is earlier. 2.2.6.3 All aircrafts are operating in VTD 31 should be reported altitude and the words “operation normal” every 30minutes to the control tower for traffic advised. a) IFR aircrafts are to call Khok kathiam tower 5 minutes prior to start up to request for ATC clearance. b) Pilots are to inform to the control tower of the call sign and proposed flight level if it is different form the flight plan. b) After take off, climb to flight plan route or as directed by ATC. 2.4.2 Aircraft are entering to land from north of Khok kathiam aerodrome, shall be reported over amphure Banmi, designated as BRAVO point (150230N1003230E) which is approximately 12 NM on RDL325 of LB NDB altitude 2000 ft. (1000 ft. for Helicopter) then proceeding to Ban Khok kathiam, designated as KILO point (145350N1003540E) 4 NM on BRG 290 of LB NDB altitude 2000 ft. (1000 ft. for Helicopter) the aircraft will be instructed to join aerodrome traffic circuit accordingly. 2.4.3 Aircrafts are entering to land from East and South east of Khok kathiam aerodrome, shall be reported over amphure Phapudthab at designated as PAPA point (144300N1004730E) which is approximately 13 NM on BRG 140 of LB NDB altitude 2000 ft. (1000 ft. for Helicopter) then proceeding to Lopburi province designated as LIMA point (144740N1003820E) 5 NM on BRG 200 of LB NDB altitude 2000 ft. (1000 ft. for Helicopter) when reaching LIMA point the aircraft will be instructed to join aerodrome traffic circuit accordingly. 2.4.4 Aircrafts are entering to land from south of Khokkathiam aerodrome shall be reported over Lopburi province designated as LIMA point (144730N1003820E) which is approximately 5 NM on BRG 200 of LB NDB altitude 2000 ft.
(1000 ft. for Helicopter) when reaching LIMA point the aircraft will be instructed to join aerodrome traffic circuit accordingly. – Conventional = 1000 ft.
– Helicopter = 500 ft.
A. Using runway 16 by entering right traffic circuit. B. Using runway 34 by entering left traffic circuit. C. Using runway 05 by entering left traffic circuit. D. Using runway 23 by entering right traffic circuit. A. Using runway 16 by left turn pattern. B. Using runway 34 by left turn pattern. C. Using runway 05 by left turn pattern. D. Using runway 23 by right turn pattern. 2.7.1.1 Simulated single emergency failure. 2.7.1.2 Simulated hydraulic system failure. 2.7.1.3 Simulated fuel control unit failure. 2.7.1.4 Simulated tail rotor failure. 2.7.1.6 Simulated run on running landing. 2.7.1.7 Simulated basic auto rotation. 2.7.1.8 Simulated hovering auto rotation. a) A flight plan shall be submitted to the control tower or base operations at least sixty minutes before departure. b) In the even of a delay of one hour in excess of the estimated off block time for any flight. The flight plan shall be automatically cancelled unless the estimated time of departure is revised by notification of the pilot in command or designated representative. 2.10.1.1 Aircraft will not be permitted to take-off unless two-way communication can be maintained with the control tower. a) Report their position, distance, heading, altitude and departure point when approaching about 15 NM or at least 10 minutes before estimated time arrival from aerodrome by transmitting in the blind. 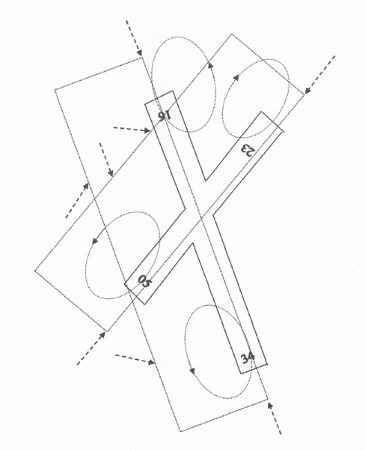 b) Observe the direction of traffic in the pattern and enter downwind with the flow of traffic. c) Make a low approach between the runway and taxiway at an altitude 1000 ft. ( 500 ft. for helicopters ) and rock the wings of the aircraft. d) Re-enter downwind leg and observe light signals pyrotechnic or signals light gun from the control tower. a) Make a low approach between the runway and taxiway at an altitude 1000 ft. ( 500 ft. for helicopters ) and rock the wings of the aircraft and flashing on and off landing light for 3 times except for the helicopters by flashing on and off search light for 3 times. b) Re-enter downwind leg and observe light signals pyrotechnic or signals light gun from the control tower. Note.- This signal should not be expected on the base and final legs of the approach. – by flashing on and off twice the aircraft’s landing lights or, if not so equipped, by switching on and off twice its navigation lights. – Initial approach level = 4000 ft.
– Runway in sight for visual approach landing. – at NDB climb on runway heading until 3000 ft return to NDB and hold. – at 1 DME climb on heading 350 until 2000 ft within 10 DME from LOB and turn left direct to MOKON and hold,or as directed by ATC. – at 1 DME climb on heading 190 until 2000 ft within 10 DME from LOB and turn right direct to MOKON and hold,or as directed by ATC.